Day in, day out doing the “same old, same old” can get, well, . . . same old. So, if life lately is about as exciting as watching paint dry or even watching your grass grow, there is plenty you can do about that. Even a small introduction of something or someone new can stimulate your life enough to shift it into the expansive one that you want to lead. Of course, everyone is different when it comes to just how stimulating and interesting you want your life to be to feel your best. For example, productivity at work settings can really vary for people. Some relish an open layout with co-workers buzzing about throwing around ideas, but others find a quiet office induces their highest level of creativity. Where you fall on the spectrum of introversion versus extroversion does not necessarily define your desire for stimulation, though, as introverts may find books or an activity with one or two just as fulfilling as a room full of people to talk to that an extrovert may find more to his or her liking. But whichever it is, finding that sweet spot for you to do your best work, establish new interests, expand your mind, learn new things and connect better with others is crucial for you to leading that balanced, healthy and enriching life you desire. 1. You must start early. Studies show childhood stimulation is critical for brain development. 2. And, keep it up. Adults don’t get a pass either as stimulation in adulthood is very important as well to maintain top cognitive abilities. Continue to exercise your brain throughout your life with new experiences, people, hobbies and more. 3. Stimulation aides in helping us feel satisfied and fulfilled. Taking on a new project or job and working with new people, traveling to a new place and experiencing various cultures helps us understand ourselves and others – all extremely satisfying and expanding. Performing the same job or task the same way every time or traveling to the same place year after year can sometimes be limiting. Perhaps expanding your comfort zone to a new place or new project is just what your emotional, creative and intellectual side needs to recharge and feel more satisfied. 4. New experiences help us aim to do better in life. Stimulating your mind and senses with new experiences or challenging yourself to learn a new skill can add a whole new dimension to your life. You will feel enriched when working towards a new goal and your curiosity is piqued when you allow others to show you something you never knew. All these new experiences could very well make you aim higher to do better and grow an interest or passion you never new was there. 5. Stimulation helps us see our own value as well as the value in others. Learning new things and being exposed to others and their ideas and talents helps you find your own passions and dreams. You may discover a hidden talent by allowing others to show you new things or you, in turn, can introduce others to new experiences that may change how they feel and live their lives. It is incredibly enriching to our all our relationships to share experiences together and helps us appreciate each other’s qualities and our various perspectives. Having a strong social network reduces isolation and stress and stimulates the brain through shared learning experiences and emotional connections. Even if you already have a good group of friends, you will likely experience stronger social connections with shared experiences. Enrolling in a class is a great way to meet new people, challenge yourself, and acquire a new skill or knowledge. What have you always had an interest in as a child? Try it now. Or, go back to school for that degree you always wanted. 2. Take on a new project. At work or at home, enhance that part of your life with a new project. After all, if you job is getting ho-hum, perhaps it is your task to try and make it more interesting and fulfilling. Make a list of books you have always wanted to read. Now is the time to start. Download or check one out at your local library and begin with the first one. This electronic reader is a great way to access just about anything that intrigues you and learn more about it! Make a goal of one a month or whatever you feel you can do. Create a time each day that you read – on the subway to work and back, 10 minutes before bed every night, etc. Stick to the plan and you will be surprised how even 10 minutes a day how many books you will end up reading and expanding your mind with new ideas. Don’t miss this: ideas for a few types of reading lists you may want to check out. Take your interest in reading a step further and create or join a book group. Combine reading with the social aspect of discussing your book to gain social benefits, too. 5. Be a movie critic. Create a list of documentaries or movies you want to see. This is so helpful when you establish “movie night” at your house and you don’t take 30 minutes to search all your options. (Or, is my family the only one that does that??) Watch them alone or with a like-minded friend who shares your taste in movies. Throw in a few odd ones, too, to mix it up! Have less than stimulating work to do? Start a timer and challenge yourself to perform the task faster. Get others to help so that you have someone to talk do while doing the task and it will go by faster. 7. Enhance your sense of smell. Burn a clean-burning scented candle while your work or try aromatherapy to brighten your senses. Learn about essential oils and aromatherapy and how it can offer health benefits. 8. Learn a new word each day. We used to have a chalkboard in our breakfast room with a “word of the week” for our family to learn each week. I admit, sometimes those words stretched out longer than a week but it was fun to challenge my children to use those words in a sentence. I think we all expanded our vocabulary as I didn’t know some of them myself! I think I will start that again! Redo a room that you spend a lot of time in or start that home renovation you have always been hoping to do. Start now and begin collecting room designs you like from magazines and Pinterst. Interview an architect and contractor to see about costs, etc. Don’t miss this: Finding your personal taste in designing your space. 10. Plant a vegetable, herb or flower garden. Even a potted one on a patio is a way to do it. Taste the foods you’ve grown or appreciate the color and beauty of the flowers you nurtured. Learn to play a musical instrument, how to read music, or take a music theory class. Choose a new radio station with a music you do not typically listen to and play in your car or while you make dinner. Don’t miss this: places to get great playlists for free and why music is good for your health. 12. Switch up your exercise routine. Try a new sport, new gym or new exercise group for your level – beginner to triathlete. 13. Make a list of day trips or affordable weekend getaways. Choose one and begin planning it now. 14. Rediscover the lost art of writing letters. Find beautiful stationary and hand-write a letter to an old friend or relative dear to you. Try using your less dominant hand for simple tasks like eating or writing. Changing hands really stimulates the brain. 16. Get a pet or adopt one. Or, train the one you have and enrich your pet’s life, too! 17. Learn to cook more healthily. The connection between what goes in your body and how you feel and how your brain performs is a strong one. Don’t miss this: Lots of healthy recipe links here. 18. Start a dinner club. Assemble six or eight people. Have each person bring one dish and alternate homes for hosting. 19. Volunteer in your community. This could be with your animal shelter, hospital, library, local theatre, etc. Giving back is a most satisfying experience. 20. Schedule a regular massage for yourself. Or learn more about massage with this. Enjoy the tactile sensation of a professional working out the stress and tension in your muscles. The relaxation it brings may bring on your most creative ideas yet! 21. Join a club or sign up for Meet-Ups in your area. You are sure to find a group with similar interests as you and the activities are planned. 22. Study a foreign language. Revive that high school language you took and plan a trip to a country where they speak it. Learn how to play chess or find a chess partner if you already know how. Reorganize a part of your home that frustrates you or slows you down in achieving your goals. For example, a pantry reorganization can help you achieve your healthier eating goals with the right foods at your fingertips. Don’t miss this: How to declutter your space easily for a more productive life. 25. Check out an art show, art museum or local exhibit. Just walking among the great works can get your creativity and appreciation flowing. Playing cards is a fun and social experience. Learn you constellations with a pair like this! Find some card-playing partners and set up a weekly or monthly card date. 27. Try a new form of expression. Learning a new art form doesn’t require that you have talent, just an interest to learn. Study the art of photography, painting, graphic design, or how to throw pottery. Exploring different cultures and breaking out of your routine this way really sharpens the mind and stimulates all your sesnses. Don’t miss this: How to make your travel dreams come true. Do some research and plan a concert series or see a play or two. Ask a friend or group and get tickets this week. 30. Stuck on how to go about a bigger change? Seek help – a health coach, career coach or counselor may help you find your path and how to get there. 31. Try a new restaurant or type of food each weekend. Ethnic restaurants are everywhere. Read about them and their best dishes before you go. 32. Romanic life a bit wanting? Join a dating group and let your friends and co-workers know you are open to meeting new people. 33. Find your sense of personal style. Learn about fashion and design or sew a piece of clothing for yourself. Pick up the phone and call a friend you have lost contact with to reestablish that friendship and make plans to call again or meet up. 35. Coach a youth team. Share your sport passions with the young to spark their interest, too. 36. Write a book, a blog, poetry or even start a journal. Share it with others, get it published or just keep it for yourself! 37. Research your past and ancestry. Find out more about your relatives and where they lived and how you got here. Document it for future family members to read. 38. Initiate and plan a reunion. What is a favorite group that has lost contact? This could be family members, old college buddies, your favorite neighborhood gang – whomever you would like to see again. You can create one to publish on-line or teach at the university or community center level. Share you talents and skills with others and watch the expansion multiply! All this talk about creating more stimulation, I know, can be the last thing you need at certain times in your life. I know I have felt that way at times saying, “I have plenty on my plate – thank you very much! No new experiences needed at this time.” I get that. If that is the case, and you are feeling over-stimulated and over-worked, do the opposite, of course. Eliminate what you can and simplify life to the essentials. Tell others you are taking a break and won’t be texting, calling, or socializing for a bit. Listen to soft music or nature sounds or even choose stillness and total silence. Eat healthy foods simply prepared. Work in solitude or in a place that relaxes you, where you won’t be interrupted. Take a hot detox bath (like this one). Meditate to achieve better focus and calmness. What have you done in your life to expand yourself lately? Care to share it and add to the list? Try these stress-reducing tools to allow for more free time to try new things. Here are a few items you may want to throw in your suitcase for emergencies if traveling to new places. DO YOU MAKE THESE DRIED FRUIT SNACKING MISTAKES? Most happy to hear you liked the post, Rhonda! Thanks for taking the time to say so! I like your tip of switching hands. It's crazy how much harder things are. Thanks for posting. Hello from Healthy, Happy, Green & Natural. So, so true! A challenge indeed, Melissa! Thanks, Jenny. Hope there is an idea or two in there for you — if not now in your life — perhaps later. This is just the positive inspiration and insight so many of us need to make our lives much more interesting, exciting and meaningful! 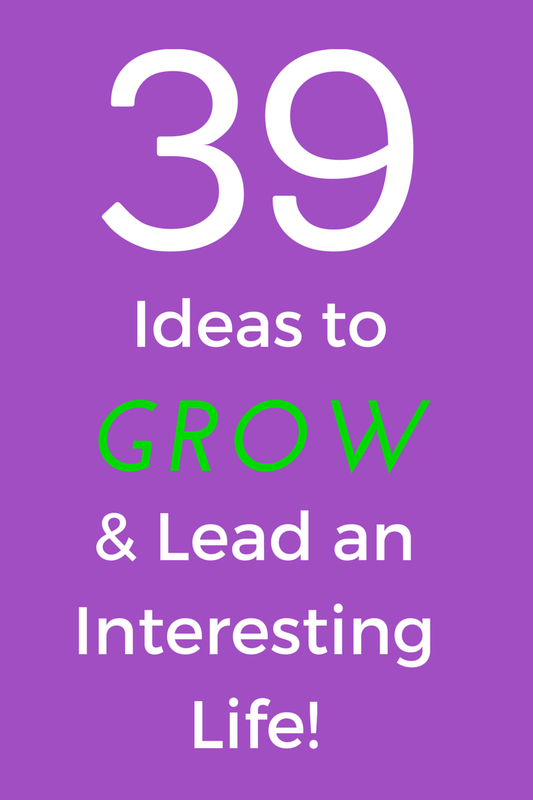 I am delighted that you shared your powerful post '39 SUREFIRE WAYS TO BE A MORE INTERESTING PERSON' with us at the Healthy Happy Green and Natural Party Blog Hop. I'm inspired! I'm pinning and sharing. I can always count on you, Deborah, to leave the kindest comments. Thanks so very, very much! Glad you liked some of the ideas, Jill! Thanks for taking the time to comment. Adorable list! Very inspirational. It is important to keep the fire burning no matter what we do. Very good point! Happy you added in here. Thanks so much. In one of my FB communities we're trying the lost art of having penpals. I've only sent out one letter though and never finished another (but haven't received any yet myself). Interesting idea! Write one today, Cassandra, and keep the connection going. Thanks for coming by. Excellent list of tips – I think the important thing is to be open-minded and just give first. Thanks for reading and taking the time to comment, Agy! Have a great weekend. I really liked this post. Great tips! Great to hear, Heather! Appreciate that so much. Lots of good ideas here! I find I naturally need stimulation and often try new things. It is easy to get overwhelmed though, and you are right, sometimes we have too much going on and have to remove ourselves for a time. Happy to see you liked the list, Michle! Thanks for taking the time to comment, too. These are such cool ideas!! I think a lot of these are also great ways to spice up a relationship! 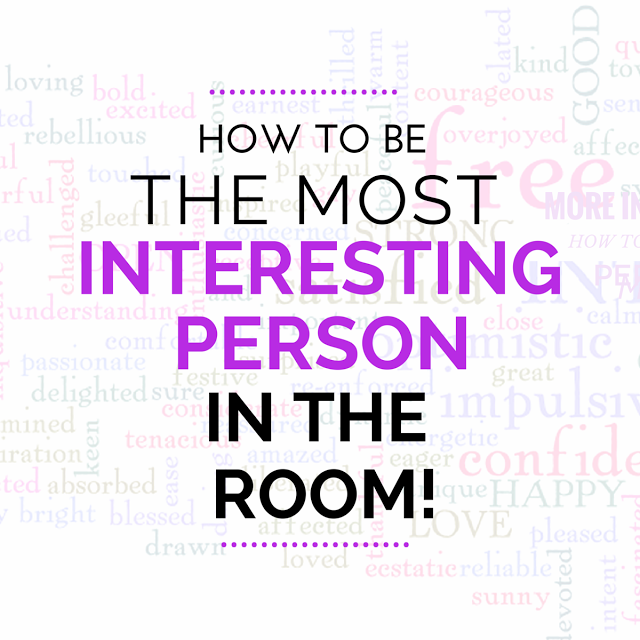 If you're both more interesting people then you'll definitely have a more interesting relationship! Excellent point, Liz! Keep our relationships strong by expanding ourselves and perhaps doing some of these ideas together. Thanks for adding in – appreciate that! Thank you so very, very much, Jenny! I appreciate the encouragement. I do believe we all have a lot to offer and there are so many ways we can expand ourselves – in both large and small ways. So glad you came by. Great, Gingi! I like to hear that. Hope you find some ideas in there but know you already have a full plate, too! Always like hearing about all your goings-on, too! Your comments always mean a lot, Helen. Thanks so much. I am sorry if life is throwing extra stress your way right now, and I do hope that works it way out very soon. What fab ideas 🙂 I'd love to get involved more with youth coaching. I'd love to start a pre-teen girls weight training group. I think it'd be so empowering! That is a wonderful idea and an age group that can always use direction and good examples. Go for it, Bri!! Great! So important for those emerging minds! Thanks for reading! Ha! Don't think you are at all, Annmarie! But, there are so many interesting ways to grow and learn new things! That means so much! So glad you found my ideas helpful! Thanks for stopping by! Thanks for adding to the list, Launna! Nice idea here. I love that list, some very good ideas to stop us stagnating. Thanks so much, Kathleen! I had fun creating it. Thanks for coming by.